Les and I were getting married in the early afternoon and we decided against an over the top day. No wedding party, no cars, no cake and no speeches. However, early in the morning, I realised that it would be a good idea if I could find some flowers. You know, just so my Mum wouldn’t be horrified by my photos when we posted them afterwards. We headed through the heavily congested Cerillos Road in the hope I could find some sort of wedding bouquet. 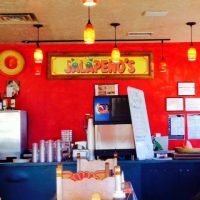 As we drove through the area, we spotted a brightly coloured sign at the side of the road for Lucia’s & Jalapenos Diner that drew us in with its promise of a hearty New Mexican breakfast. There are few things that make me want to visit an eatery more than seeing it’s well decorated. Particularly when that style is a gorgeously bright Spanish/Mexican. A bubbly female hostess greeted us at the door and told us to take a table and make ourselves at home. As we were getting married later that afternoon, neither of us could decide whether to go for something light (which is difficult in a Mexican restaurant) or just go all out and indulge. We eventually decided to go for meals that would keep our energy up to get through the ceremony and stop our stomachs rumbling in front of the judge during a quiet pause in our vows. We both ended up opting for the full whack. I had Huevos Rancheros, which is a Mexican omelette with refried beans, cheese and LOTS of chilli. Les order the breakfast enchilada plate, which included fried potatoes, refried beans, salad and a huge enchilada all smothered with melted cheese. It looked largely the same as my breakfast, but with slightly less heat. Both plates were really fantastic. Had there been more, I’d have eaten it, even if it meant struggling into my dress later that day. Who doesn’t want enchiladas for breakfast? If you’re getting married, I’d highly recommend a hearty New Mexican breakfast. It’ll get you through to that all-important after-vow happy hour. Probably don’t drink before the ceremony, though, but definitely go for it afterwards. After all, by then, you’re married and it’s too late for your SO to change their minds, yes? Even if you’re not getting married, you should totally drop by anyway. Despite being on a busy road, as soon as you walk into Lucia’s & Jalapenos, it’s easy to forget the rush of traffic outside. You can disappear into the colourful, quiet world that exists within the diner. It seems a million miles away from everything going on in the world outside. Our breakfast was relaxed and tasty and the service was friendly and attentive. If we’d had a little more time, we’d love to have gone back for lunch or dinner.